Aircraft emissions have an impact on the Earth's radiation budget and climate through direct and indirect changes in aerosols and cloudiness. Recent climate assessments have stressed the importance of natural and anthropogenic changes in aerosols on direct radiative forcing (Charlson et al., 1990; Schwartz, 1996). Aerosols and contrails have direct effects (scattering and absorbing solar and longwave radiation) and indirect effects (modifying the formation of cloud particles and radiative properties of clouds). Several studies have addressed the direct impact of contrails (e.g., Detwiler and Pratt, 1984; Grassl, 1990; Liou et al., 1990; Sassen, 1997). The indirect effect of contrails has not yet been investigated in detail. The direct radiative impacts of aircraft soot emissions (Pueschel et al., 1992, 1997) and sulfate aerosol have been evaluated as being small (Friedl, 1997; Brasseur et al., 1998). The indirect radiative effect of aircraft-induced aerosols on clouds is essentially unknown. In fact, the indirect radiative effect of non-aviation aerosol has been studied for liquid water clouds (IPCC, 1996), but the indirect effect of changing cirrus is not yet known either. Here, the discussion focuses on the impact of aircraft-generated aerosol and that of contrails and changed cirrus clouds. Table 3-7: Sensitivity of daily mean of instantaneous net forcing at top of the atmosphere by contrails to a range of values for various parametersa for 100% contrail cover. The first two rows contain results from models FL, M, and N; the others are from model N.
a) Details in Meerkï¿½tter et al. (1999). Reference case for mid-latitude summer (McClatchey et al., 1972) as in Table 3-6; spherical particles; solar zenith angle of 60ï¿½; diurnal sunshine fraction of 50%; IWC of 21 mg m-3; volume mean particlediameter of 32 ï¿½m; surface temperature of 294 K; no low-level clouds; relative humidity of reference profile (McClatcheyet al., 1972) varying from 77% at the surface to 11% at 12-km altitude; contrail depth 200 m; and contrail top at 11-km altitude. Radiative forcing is defined as the net radiative flux change at some level in the atmosphere calculated in response to a perturbation, such as a change in cloud cover. The definition of radiative forcing used here is the "instantaneous" or "static" flux change at the top of the atmosphere (TOA) (IPCC, 1996) (see Chapter 6). A positive net flux change represents an energy gain, hence a net heating of the Earth system. The direct radiative impact of aircraft-induced aerosol is much smaller than that of volcanic stratospheric or regional tropospheric aerosol and smaller than other aircraft-induced radiative forcing values (see Chapter 6). Radiative forcing by aerosol depends on many parameters (Haywood and Ramaswamy, 1998). For aerosol in the size range 0.1 to 1 ï¿½m, the increase in solar reflectance (albedo effect) exceeds the trapping of terrestrial radiation (greenhouse effect), causing a surface cooling (Lacis et al., 1992, Minnis et al., 1993; Minnis et al., 1998c). Aircraft-induced aerosols could have an importance similar to that of natural stratospheric aerosol variations if their optical depth in the solar range were of comparable magnitude to that of natural stratospheric aerosol. The optical depth of aerosol is proportional to its column load. The maximum zonally averaged column load from soot emissions and aircraft-induced sulfuric acid is estimated (see Section 3.3) to be less than 1 and 6 ng cm-2, respectively. Small sulfuric acid particles are nonabsorbent but scatter strongly in the shortwave spectrum, with mass scattering efficiencies of 7 (4-10) m2 g-1 in the solar range depending on relative humidity (Boucher and Anderson, 1995; Lacis and Mishchenko, 1995). Soot is a strong absorber of solar energy, with mass extinction coefficients of about 10 m2 g-1 (Pueschel et al., 1992; Penner, 1995; Petzold and Schrï¿½der, 1998). As a consequence of the product of given column load and extinction efficiency, the maximum change in zonal-mean optical depth from aircraft soot and sulfate aerosol is less than 4 x 10-3. For comparison, the solar optical depth of stratospheric aerosol varies typically between 0.005 and 0.15, depending on volcanic aerosol loading (Sato et al., 1993). Regionally, within the main flight corridors, a particle concentration change of approximately 30 cm-3 at 0.1-ï¿½m mean diameter over a vertical layer of 2 km cannot be ruled out (Schumann et al., 1996; Friedl, 1997; Schlager et al., 1997), implying a mass load on the order of 10 ng cm-2 and a solar optical depth of about 0.001. This regional change is small compared with other regional variations. Tropospheric aerosol layers with optical depth of 0.1 to 0.5 occur frequently off the coasts of North America and Europe (Russell et al., 1997). Contrails are ice clouds with radiative effects similar to thin cirrus cloud layers (Liou, 1986; Raschke et al., 1998). At the TOA, thin layers of cirrus clouds or contrails tend to enhance radiative forcing and hence the greenhouse effect because they cause only a small reduction of the downward solar flux but have relatively larger impact on the upward terrestrial radiative flux. An increase in cloud cover by thin cirrus clouds may therefore cause an increase in the net energy gain of the planet (Stephens and Webster, 1981; Fu and Liou, 1993). Contrails and cirrus clouds also have an impact on the radiative energy budget at the Earth's surface. Although radiative forcing at the TOA is most important for long-term and global climate changes, forcing at the surface may have short-term regional consequences. Figure 3-20: Shortwave (SW), longwave (LW), and net instantaneous radiative flux change from contrails with 100% cover under mid-latitude summer conditions averaged over a day as a function of optical depth (0.55 ï¿½m): Near the top of the atmosphere (50 km) and surface (0 km) (from Meerkï¿½tter et al., 1999). Longwave (LW) radiative forcing by cirrus or contrails is greatest when clear-sky radiative flux to space is large (i.e., larger over warm than over cool surfaces, larger in a dry than in a humid atmosphere) and cloud emissivity is large (Ebert and Curry, 1992; Fu and Liou, 1993). For thin clouds, emissivity increases with ice water path, which is the product of the ice water content (IWC) of the cloud and its geometrical depth. The emissivity of ice particles in a cirrus layer is much larger, in particular at 8 to 12 ï¿½m (King et al., 1992; Minnis et al., 1998c), than that of the same amount of water in gaseous form. Hence, absorption and emission from an atmospheric layer increase when ice particles form at the expense of ambient water vapor (Detwiler, 1983; Meerkï¿½tter et al.,1999). Shortwave (SW) radiative forcing of cirrus clouds is determined mainly by solar zenith angle, surface albedo, and cloud optical depth (which increases with ice water path) (Ebert and Curry, 1992; Platt, 1997). For fixed ice water path, clouds containing smaller particles have larger optical depth and exhibit larger solar albedo (Twomey, 1977; Betancor-Gothe and Grassl, 1993). Aspherical particles cause a larger albedo than spherical ones (Kinne and Liou, 1989; Gayet et al., 1998). SW forcing is negative when the cloud causes an increase of system albedo. In general, SW forcing has a greater magnitude over dark surfaces than over bright surfaces. The net radiative forcing of clouds is the sum of SW and LW flux changes and may be positive or negative. Thin cirrus clouds cause a small but positive radiative forcing at the TOA; thick cirrus clouds may cause cooling (Stephens and Webster, 1981; Fu and Liou, 1993). In the global mean, an increase in cirrus cloud cover warms the Earth's surface (Hansen et al., 1997). Maximum heating is reached at intermediate ice water path, corresponding to an optical depth of about 2 to 3, and the effect shifts to small cooling for optical depths greater than about 10 to 20 (Platt, 1981; Jensen et al., 1994a). Net forcing also varies with particle size but less than its two spectral components. For thin cirrus, smaller particles (but > 3-mm radius) tend to cause stronger heating by increasing cloud albedo less strongly than emissivity (Fu and Liou, 1993). Contrails are radiatively important only if formed in ice-supersaturated air, where they may persist and spread to several-kilometer lateral widths and a few hundred meters vertical depth (Detwiler and Pratt, 1984; Jï¿½ger et al., 1998) (see also Section 3.4.4). In contrast, shorter lived contrails have much smaller spatial and temporal scales, hence contribute much less to the radiation budget (Ponater et al., 1996). The impact of contrails on transmission of radiation depends on their optical depth. In the solar range (near a wavelength of 0.55 ï¿½m), the optical depth of observed persistent contrails varies typically between 0.1 and 0.5 (Kï¿½stner et al., 1993; Sassen, 1997; Jï¿½ger et al., 1998; Minnis et al., 1998a). Occasionally, very thick contrails (on the order of 700 m) with optical depths greater than 1.0 are found at higher temperatures (up to -30ï¿½C) (Schumann and Wendling, 1990; Gayet et al., 1996). The optical depth in the 10-ï¿½m range is about half that near 0.55 ï¿½m (Duda and Spinhirne, 1996). Particles in young persistent contrails are typically smaller (mean diameter 10 to 30 ï¿½m) than in other cirrus cloud types (greater than 30 ï¿½m) (Brogniez et al., 1995; Gayet et al., 1996) but grow as the contrail ages and may approach the size of natural cirrus particles within a time scale on the order of 1 h (see Section 3.4) (Minnis et al., 1998a). The number density of ice crystals in contrails (on the order of 10 to 200 cm-3) is much larger than in cirrus clouds (Sassen, 1997; Schrï¿½der et al., 1998b). Reported IWC values in aged contrails vary between 0.7 and 18 mg m-3 (Gayet et al., 1996; Schrï¿½der et al., 1998b), consistent with results from numerical studies (Gierens, 1996). As for cirrus clouds (Heymsfield, 1993; Heymsfield et al., 1998b), the IWC of contrails is expected to depend on ambient temperature (Meerkï¿½tter et al., 1999) because the amount of water mass available between liquid and ice saturation (for temperatures < -12ï¿½C) increases with temperature (Ludlam, 1980). Hence, contrails may be optically thicker at lower altitudes and higher temperatures. Contrail particles have been found to contain soot (see Section 3.2.3). Soot in or on ice particles may increase absorption of solar radiation by the ice particles, hence reduce the albedo of the contrails. The importance of soot depends on the type of internal or external mixing and the volume fraction of soot enclosures. Because soot particles are typically less than 1 mm in diameter, their impact on the optical properties of ice particles in aged contrails is likely to be small. Contrail particles often deviate from a spherical shape (see Section 3.4.4). The magnitude and possibly even the sign of the mean net radiative forcing of contrails depends on the diurnal cycle of contrail cover. For the same contrail cover, the net radiative forcing is larger at night. Satellite data reveal a day/night contrail cover ratio of about 2 to 3 (Bakan et al., 1994; Mannstein, 1997). Aviation fuel consumption inventories suggest a longitude-dependent noon/midnight contrail cover ratio of 2.8 as a global mean value (Schmitt and Brunner, 1997). Table 3-8: Shortwave (SW), longwave (LW), and net radiative flux changes (Wm-2) at top of atmospherein global mean as caused by contrails in 1992 and 2050 scenario Fa1 (see Section 3.7.2 and Chapter 9), for contrail cover as shown in Figure 3-16 and for solar optical depths of 0.1, 0.3, and 0.5 for contrails (Minnis et al., 1999). The last line gives the results for temperature-dependent ice water content (IWC) with variable optical depth. of 200 hPa and assumed tobe 220-m thick with aspherical ice particles of 24-ï¿½m volume mean diameter.IWC in contrails was adjusted to result in anoptical depth of 0.1, 0.3, or 0.5. A case with IWC set to half the amount of water available for ice formation from vapor at 100% humidity relative to liquid saturation (temperature-dependent IWC) is also considered (variable optical depth).Net TOA forcing is computed with model FL as difference of results with and without contrails. 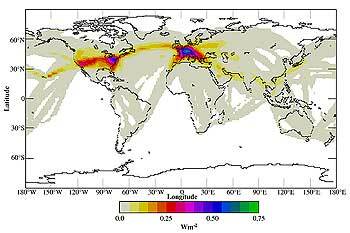 Figure 3-21: Global distribution of net instantaneous radiative forcing at the top of atmosphere in daily and annual average for present (1992) climatic conditions and analyzed contrail cover (see Figure 3-16) and 0.55-ï¿½m optical depth of 0.3 (Minnis et al., 1999). LW flux changes. The magnitude of SW forcing is larger over dark ocean than over bright snow surfaces and larger for hexagonal ice particles than for spheres. LW forcing is larger in the tropics than in polar regions. Despite the small ocean albedo, net forcing is largest in the tropics because it has the warmest lower atmosphere. These results are consistent with the expectation that net forcing is smallest over cool and dark surfaces. Net forcing over the mid-latitude continent is larger in summer than in winter. Hexagonal particles cause a larger albedo than spherical ones, therefore less net forcing. These results show that contrail heating generally prevails over cooling in the atmosphere-surface system. However, this finding does not preclude situations in which contrails cause a net cooling-for example, very cold surface, high atmospheric humidity, low surface albedo, very small particles (< 10 ï¿½m; the limit depends on the ice water path in the cloud), or large optical contrail depth (> 10). TOA radiative forcing depends mainly on the cover and on parameters that determine the solar optical depth of contrails and to a minor degree on other parameters. Forcing is very weakly sensitive to the methods used for radiative transfer calculations. This sensitivity can be seen from Table 3-7, which lists the results of a parameter sensitivity study with models FL, M, and N (Meerkï¿½tter et al., 1999). Except for the first two rows of Table 3-7, results are from model N only because the results of the three models agree with each other to within 3%. The largest model differences are found for aspherical particles, which are represented by different shapes in various spectral regions in the models, but all models show smaller net forcing for aspherical particles than for spherical ones, as expected (Kinne and Liou, 1989). The results also depend rather strongly on solar zenith angle, ice water content, particle diameter, surface albedo, and relative humidity. Low-level clouds with large cover and optical depth reduce SW and LW forcing of the cloud-free case below a contrail, causing a small net increase of forcing. Variations in surface temperature (here ï¿½ 5 K) cause small LW flux changes. Lowering the altitude of a contrail for fixed IWC reduces the LW effect slightly. Lowering the altitude of the contrail and using the IWC that is expected for the higher temperature at lower levels makes the lower contrail optically thicker and radiatively more effective than the higher contrail. Hence, TOA radiative forcing by contrails grows with increasing surface temperature, surface albedo, and IWC. For the same IWC, contrails with small ice particles are more effective in radiative forcing than contrails with larger particles. Representative forcing values are approximately 25 to 40 W m-2 for 100% contrail cover and 0.55-ï¿½m optical depth of 0.5. Radiative forcing by contrails depends strongly on the optical depth of the contrails and is different at the surface than at the TOA. Figure 3-20 shows computed SW, LW, and net change in radiative fluxes at the TOA (actually 50 km) and at the surface for 100% contrail cloud cover for the mid-latitude summer continental reference case with spherical ice particles. The ice water content was varied to yield different values of the 0.55-ï¿½m optical depth t. The trends are consistent with those found in cirrus studies (Fu and Liou, 1993). At the TOA, LW forcing is larger than SW forcing, giving a net heating of the atmosphere that is maximum near t = 3. The flux increases slightly less than linearly with optical depth for small values of t. The net forcing changes sign and becomes negative for t > 10 (not shown), but contrails are probably never that optically thick. This analysis indicates that contrails heat the atmosphere below them. Table 3-9: Global radiative forcing by contrails and indirect cloud effects in 1992 and 2050 (scenario Fa1). No entry indicates insufficient information for best-estimate value. In all cases, TOA and top of the troposphere radiative flux changes from contrails differ by only about 10%; therefore, the instantaneous or static flux change gives a reasonable approximation for the adjusted radiative forcing as considered in IPCC (1996). At the Earth's surface, LW flux changes are much smaller because water vapor closes much of the infrared radiation window in the lower atmosphere. In contrast, SW flux changes are only a little smaller than at TOA. Hence, the daytime SW contribution dominates and cools the surface in the daily mean. A reduction of solar radiation by 40 W m-2 has been measured locally in the shadow of contrails, although the simultaneous change in infrared flux in the shadow of contrails was very small (Sassen, 1997). Hence, the Earth's surface is locally cooled in the shadow of contrails. This analysis does not exclude warming of the entire atmosphere-surface system driven by the net flux change at TOA. As radiation-convection models show, for example, vertical heat exchange in the atmosphere may cause a warming of the surface even when it receives less energy by radiation (Strauss et al., 1997). Cooling of the atmosphere below contrails is also suggested by measurements of solar and infrared upward and downward fluxes above and below a few persistent contrails (Kuhn, 1970). These measurements show a strong (10-20%) reduction of net downward radiation just below approximately 500-m-thick contrails with little change in LW fluxes. Further investigation is required to demonstrate how these results depend on the geometry and age of contrails. Contrail cirrus induce a heat source by the change in divergence of solar and infrared radiation fluxes mainly within but also below the contrail in the upper troposphere (Liou et al., 1990; Strauss et al., 1997; Meerkï¿½tter et al., 1999). In the atmosphere below a contrail, the change in heat source is on the order of 0.3 K/day for 100% cover. When the contrail is located above a thick lower level cloud, the atmosphere is heated only above the lower cloud; the heat source is essentially zero below the lower cloud. In the diurnal cycle, radiative forcing by contrails is positive and strongest during the night because of the absence of negative SW forcing (see Table 3-6). For small optical depth, net forcing at TOA is also positive during the day, hence always positive regardless of the diurnal cycle of contrail cover. Negative SW forcing is maximum not at noon but during morning or afternoon hours, when the solar zenith angle is near 70ï¿½. Other than at TOA, the net flux change is negative at the surface even for thin contrails during the day, in particular at intermediate zenith angles. The maximum day-night difference in net radiative forcing at the surface for cloudless summer mid-latitude conditions is about 20 W m-2 for constant 100% contrail cover with optical depth of 1 and constant surface temperature, and slightly less when accounting for the daily temperature cycle. Table 3-10: Parameters affecting future changes in aircraft-produced aerosols and cloudiness and theirimpacts on contrails and aerosol abundance. Symbols indicate sign of change in the parameter and in the impact. Question marks indicate uncertainty in sign or importance of an impact. The symbol x indicates lack of a known or important impact. Figure 3-22: Trend in overall efficiency of propulsion h (solid circles), computed from aircraft specific fuel consumption (SFC) data (open circles; data as in Figure 7-9), according to h = V(Q SFC)-1, with V as the aircraft speed (~240 m s-1 ) and Q as the specific heat of combustion of aviation fuels (43 MJ kg-1). Solid circles also denote the critical altitude z (right axis) above which contrails form (for 100% relative humidity in the mid-latitude standard atmosphere) for the years 1960 to 2010. Figure 3-23: Persistent contrail coverage (in % area cover) based on meteorological analysis data and on fuel emission database for 2050 (Fa1 fuel consumption scenario for 2050), assuming linear dependence on fuel consumption and overall efficiency of propulsion h of 0.5; global mean cover is 0.5%. Compare with Figure 3-16 (from Gierens et al., 1998). 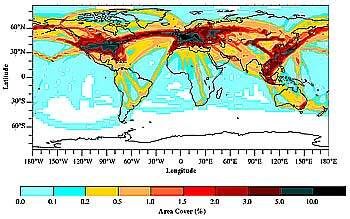 The global distribution of radiative forcing from contrails can be estimated using a radiation transfer model, the expected contrail cover, and a realistic representation of the cloudy atmosphere and surface (Minnis et al., 1999). Global contrail cover for 1992, for example, is shown in Figure 3-16 (see Section 3.4.3). Global mean values for TOA radiative flux are summarized in Table 3-8, along with details of the calculations. As expected, SW forcing is negative and LW and net forcings are positive. All three values increase less than linearly with solar optical depth t. The resulting 1992 global distribution of TOA net forcing for t of 0.3 is shown in Figure 3-21. Forcing is largest in regions of heavy air traffic, with maximum values over northeast France (0.71 W m-2) and near New York (0.58 W m-2). Although the contrail amount is higher over the northeast United States of America, net contrail forcing over Europe is greater because of the greater LW forcing term. The global mean net forcing for t between 0.3 and 0.5 is about 0.02 W m-2; the zonal mean value is largest near 40ï¿½N, with a value five times larger than the global mean. Computed results for global radiative forcing by contrails depend on assumed values for contrail cover and mean optical depth of contrails. Neither is well known. Here, the computed global contrail cover was normalized to yield 0.5% observed cover by line-shaped contrails over Europe, guided by satellite data. Because satellite data mainly reveal thicker contrails, a larger cover resulting from the presence of optically thin contrail cirrus might not be accurately detected. Therefore, the results for larger t values (0.3 to 0.5) are considered in combination with the given contrail cover (0.1% globally) as being most representative for real forcing conditions. Hence, in the diurnal and annual mean, a global 0.1% increase in thin contrail cloud cover causes a net heating of the Earth-atmosphere system of approximately 0.02 W m-2. The difference between the largest and smallest net forcing values in Table 3-8 suggests an error bound on the order of 0.01 W m-2. Based on Section 3.5, the actual global cover may (with 2/3 probability) be 2 to 3 times smaller or larger than the derived line-shaped contrail cover. The optical depth value is likely known to a factor of 2 to 3. Thus, for assumed Gaussian behavior of individual uncertainties, the radiative forcing value may differ from the best estimate by a factor of about 3 to 4. Based on computations using estimates of line-shaped contrail occurrence for the 1992 fuel scenario (0.1% cover), the best estimate of global-mean radiative forcing is positive, has a value of about 0.02 W m-2 with an uncertainty factor of 3 to 4, and may range from 0.005 to 0.06 W m-2 for present climate conditions. Certainly, the state of our understanding is only fair. Future investigations may result in considerable changes to the best estimates. Global radiative forcing by contrails obviously is much smaller than that attributed to other anthropogenic changes in the past century-1.5 W m-2, which represents about the median of the range of values given in IPCC (1996) but comparable to the forcing by past CO2 emissions by aircraft (Brasseur et al., 1998; see Chapter 6). A mean radiative forcing of 0.02 W m-2 induces a vertically averaged heat source in the troposphere equivalent to approximately 0.0002 K day-1. The atmosphere reacts to this heat source in a complex manner (Ponater et al., 1996) and may take decades to reach a steady-state temperature response. In steady state, the mean surface temperature may increase by about 0.01 to 0.02 K globally if climate sensitivity from contrail forcing is comparable to that of well-mixed greenhouse gases (IPCC, 1996; see Section 6.2.1). In comparison to the global mean value, annually averaged zonal mean values are larger by a factor of about 5, and regional values are larger by a factor of up to 40 (see Figure 3-21). The pattern of the climate response differs from the pattern of radiative forcing, in particular at small regional scales. Zonal mean steady-state temperature changes of between 0.01 and 0.1 K appear to be possible for present contrail cover when previous studies as scaled to the cover and radiative forcing found here (Liou et al., 1990; Ponater et al., 1996; Strauss et al., 1997). Regional contrail forcing may have short-term consequences for the daily temperature range in such a region if contrail forcing persists for at least a day. These temperature changes appear to be too small to be detectable in comparison to atmospheric temperature variations. 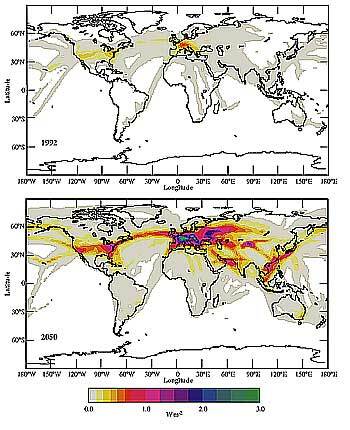 Figure 3-24: Global distribution of net radiative forcing at top of atmosphere in daily and annual average for contrails with 0.55-ï¿½m optical depth of 0.3: For 1992, as in Figure 3-21; and for the 2050 scenario with contrail cover as shown in Figure 3-23 (Minnis et al., 1999). Besides forcing by line-shaped contrail cirrus, the global radiation balance may also be perturbed if there is a significant indirect effect of aircraft-induced aerosol, water vapor, and contrails on the coverage and properties (particle size distribution, number density, and composition) of "natural" cirrus clouds. In addition, there might be other indirect cloud-related effects, such as changes in humidity and precipitation. The principal effects might be similar to those caused by volcanic aerosol mixed down into the troposphere (see Section 3.4.5). Radiative forcing will be enhanced by any increase in the cover of thin cirrus caused by aircraft beyond that of line-shaped contrail cirrus. If the additional global cirrus cover is as large as 0.2% (the estimated upper bound for 1992; see Section 3.5.1.5), and if the optical properties of this additional cirrus are the same as for line-shaped persistent contrails (optical depth of about 0.3, as also found often for natural cirrus; see Section 3.4.1), then the radiative forcing from the additional cirrus may be as large as 0.04 W m-2-which is twice the value for line-shaped contrail cirrus. Aircraft emissions may also change the properties of natural cirrus clouds (see Section 3.4.5). In a high-traffic region, cirrus was found to be affected by soot emissions from aircraft, causing an approximate doubling of the ice particle concentration (Strï¿½m and Ohlsson, 1998). Smaller particles cause larger optical depth for constant ice water content. Radiative forcing is strongly sensitive to particle size (see Table 3-7). As Figure 3-20 indicates, an increase in optical depth causes additional heating if the cirrus cloud was optically thin but cooling if it was optically thick (Wyser and Strï¿½m, 1998). One recent study suggests that the indirect heating effect of aviation-induced changes in cirrus ice particle number density for fixed cloud cover may be positive and comparable to or even larger than that from increases in cloud cover (Meerkï¿½tter et al., 1999). While the impact of particle changes on radiative forcing by cirrus clouds may be studied parametrically, our understanding is very poor with respect to other indirect effects. Although comprehensive investigations are missing, there is no evidence that any of the indirect effects are important. Table 3-9 summarizes the assessment of global radiative forcing by aviation-induced cloudiness for 1992. The results for 2050 are explained in Section 3.7.